In this collection, the third in the series of Locke and Key, we see Dodge visit the spirit of Sam Lesser, the boy he used to kill Rendell Locke, which kicked off the events of the Locke children moving to Keyhouse in the first place. Sam, having been thrown through the Ghost Door, is understandably bitter at Dodge and the two have an altercation that ends with Sam giving a cryptic warning. Later, we see Kinsey exploring the a dangerous area near Keyhouse, which gives clues to some of the past surrounding the Locke family and their current residence. 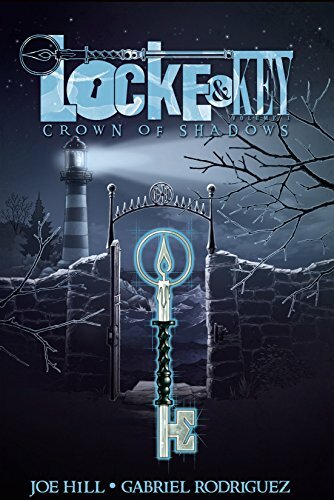 However, we see Dodge take possession of the Crown of Shadows, which wreaks havoc on the Locke children throughout Keyhouse and Tyler is forced to use the Giant Key to grow to a huge size so he can fight a giant shadow monster that seems to be controlling smaller shadow monsters throughout Keyhouse. After all of this, near the end of this compilation Nina Locke finds a key to a cabinet that will mend things, but it is mysterious and possibly dangerous. This issue has a lot of fun events and we see more of Dodge and his plan, plus we get a few new keys that are really neat. Mind you, writing about a graphic novel doesn’t come close to doing it justice, but again, the artwork in this one is great and we have some really amazing action scenes, with the shadow monsters being one of my favorite parts of this volume. As we go along in the series, we see that Dodge is willing to do just about anything to keep his identity a secret but is also singularly focused on achieving his end goal. With the multiple storylines, more secrets about Keyhouse being uncovered and new keys/powers popping up, I hope (if you’re reading along) that you’re enjoying the story thus far. I also want to point out a fun aspect of these collections is the list of keys in the back of the books. They’re one of the more creatives pieces of the complications because we get to see there are so many bits of magic in Keyhouse we’re unaware of and there’s more to see as we read on.